Photographer and animal rights activist Seth Casteel forever changed our perspective on canines with his underwater camera and a pool full of pooches in Underwater Dogs. 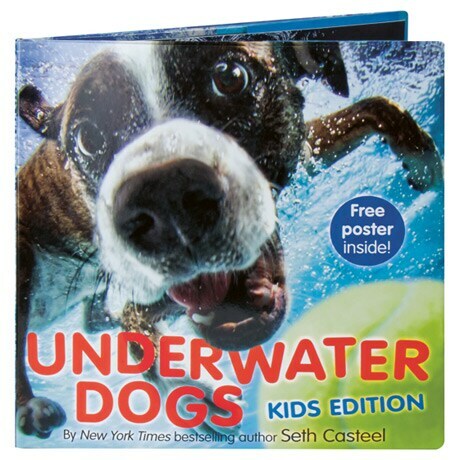 In this kid's edition of that wildly popular book—combining new photos with past favorites—Casteel leaves out some of the toothiest, wildest-eyed portraits to focus instead on the essence of play in his images of dogs chasing toys in the water. Here are 36 portraits of two dozen dogs (whom we get to meet in a rogues' gallery at the end) accompanied by a lighthearted rhyming text, for readers 4 to 7. The reverse side of the dust jacket is a 29-inch-long poster featuring cover-dog Wrigley.